The offense assigns each player a number. The offense encourages guards to post up and forwards to shoot from the outside. Players go to assigned spots but react to the defense. 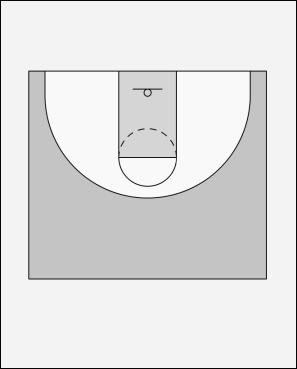 First, low post (5) sets a screen for the guard (1). (1) cuts off the screen. (5) look to get the ball at the elbow. If not, move back to outside. (4) cuts into lane and interchange with (2). * (5) hits a jump shot from the free-throw line. * (4) gets a lay-up cutting to the hoop. Ball "swings" from (3) to (5) to (2). (1) sets a screen for (3). (3) comes across to the low post. * (3) makes a short shot cutting off back screen. * (1) opens up after screening for a bucket. Ball is passed to (4). The offense runs again, this time from the left side.